Fluorescent pigment paste, is fluorescent pigment particles dispersion which is produced by fluorescent pigments and through the grinding and dispersing process. Unlike normal pigments, fluorescent pigments can convert some absorbed light (including ultraviolet light) into longer wavelength and similar to the normal reflected light, it is fluoresces. This fluorescent and normal light is combined, and makes fluorescent pigment colors are particularly bright. The color and performance of fluorescent pigment pastes are determined by the fluorescent pigment types. Fluorescent pigments are made by some fluorescent colorant which is fused to the polymer carrier resin through chemical or physical methods, and further processed to pigment powders. Amine-based resin is the most commonly carrier used for fluorescent pigments, it has poor heat resistance, and contains formaldehyde. 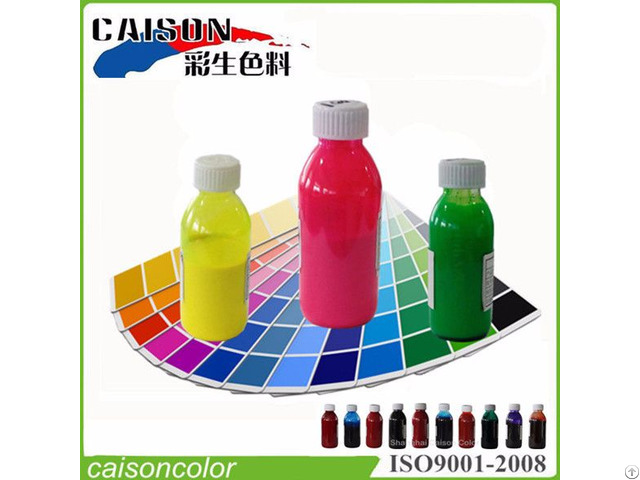 When summer is coming, fluorescent pigment paste that is produced by fluorescent pigments used this kind carrier had bad high temperature resistance, it is easy to be bulging in summer weather. 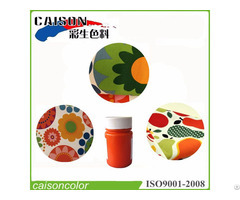 It is due to the fluorescent pigment structure and performance defects. Polypropylene resin has better sunlight fastness, and formaldehyde limit standards can meet the safe standard of adult underwear skin directly touched: less than 75PPM. Polyamide-based resin and polyester resin are all good high temperature resistance, limited standard of formaldehyde is also less than 75PPM. They are the the best fluorescent pigment carrier according to the comprehensive application. We have 33 types of fluorescent pigment paste, rich colors, is divided into four categories, to meet different fluroescent coloring requirement from clients. Among of them, 8 series fluroescent pigment paste has 8 colors, they are made by fluorescent pigments that uses amine-based resin as carrier. So 8 series fluroescent pigment paste is not good performance on heat resistance. It's easy be bulging under the storage condition of 40 degrees Celsius or higher. 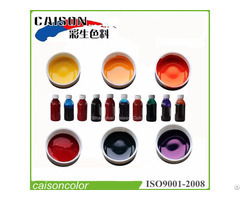 CAISON brand CTH series water based pigment paste has 25 colors of fluorescent pigment paste. They are produced by different fluorescent pigments which respectively uses three different resins as carrier. There are benzene melamine-formaldehyde resin and polypropylene resin, which have excellent heat resistance. 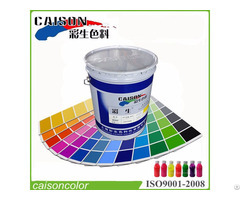 So CAISON CTH series fluroescent pigment paste is good for using and storing in high temperature weather, In particular, CTH series B type fluorescent pigment paste: when they are added by 30% for textile printing or dyeing, the formaldehyde limited standard is in full compliance with the adult clothing standards: less than 75PPM!